Interactions among cellulose, hemicellulose and pectins are important for plant cell wall assembly and properties and also for industrial applications of these polysaccharides. Therefore, binding of pectin and xyloglucan on microcrystalline cellulose was investigated in this experiment by adsorption isotherms, zeta potential and scanning electron microscopy (SEM). Analysis of three isotherm models (Langmuir, Freundlich and Fowler-Guggenheim isotherms) showed that the experimental adsorption isotherm was well described via the Fowler-Guggenheim model, which includes lateral interaction between the adsorbate. The adsorption isotherm and zeta potential measurement showed that at temperature 25 °C only xyloglucan adsorbed on the microcrystalline cellulose. In case of xyloglucan on cellulose, the equilibrium was reached in about 3–4 h, and the kinetics of adsorption were well described by the multiexponential equation. Analysis of the model suggests that two steps can be distinguished: diffusion and reconformation in an adsorbed layer. No adsorption of pectin was observed in this study. 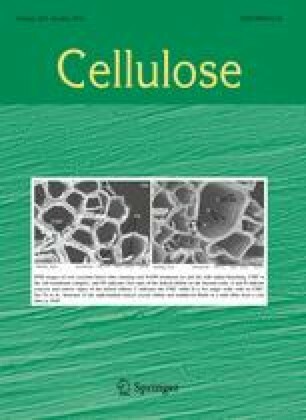 SEM study showed that xyloglucan may prevent cellulose from aggregation. Cellulose consists of an unbranched polymer chain of β-(1 → 4)-linked glucose residues. In the native cellulose crystallites, the molecules have a flat ribbon shape with intramolecular hydrogen bonds, and they cohere owing to intermolecular van der Waals and hydrogen bonding interactions. In nature, these molecules are often grouped into clusters (elementary fibrils) of 18 or more chains. The clusters can diffract an X-ray beam and are therefore considered to be crystalline. The glucan chain length (degree of polymerization) varies from about 2000 to more than 25,000 glucose residues (Cousins and Brown 1995; Brown et al. 1996). These chains are long enough (about 1–12.5 μm long) to extend through multiple crystalline and amorphous regions within a microfibril (Taiz and Zeiger 2002). The hemicellulose xyloglucan (XyG) is found in the cell walls of all vascular plants and is the major hemicellulose in the primary cell wall of dicotyledons, where it is believed to play an important role in cell wall structure and function (Taiz and Zeiger 2002; Eckardt 2008). Like cellulose, this polysaccharide has a backbone composed of (1 → 4)-linked β-d-glucose residues. Additionally, it has short side chains of xylose, galactose and often but not always a terminal fucose or arabinose, which prevent the assembly of xyloglucan into a crystalline cellulose-like microfibl. Tamarind xyloglucan is an example of non-fucosylated storage xyloglucan (Zykwinska et al. 2008; Kozioł et al. 2015), and its molar mass is estimated at 763 kDa (Zykwinska et al. 2005). The conformation may partially resemble a flat ribbon, which is thought to be able to create hydrogen bond to the similar β-glucan chains of cellulose on the surface of the microfibril (Albersheim et al. 2011). Moreover, some XG molecules may penetrate and disrupt the microcrystalline parts of cellulose molecules (Pauly et al. 1999). Pectins together with hemicelluloses are matrix components of the primary cell wall; they can be extremely heterogeneous between plants and tissues and even within a single cell wall. Three major pectic polysaccharides are known: homogalacturonan (HG), rhamnogalacturonan I (RGI) and rhamnogalacturonan II (RGII). Their backbones and side chains contain acidic sugars and neutral sugars (Taiz and Zeiger 2002; Willats et al. 2006). According to the common plant cell wall model, the cellulose is organized in microfibrils, which are tethered and connected via hemicelluloses. Recent findings suggest that only a very minor part of hemicelluloses, i.e., xyloglucan, would be in tight interactions with the cellulose crystalline structure (Park and Cosgrove 2015). The cellulose–xyloglucan network is embedded in a highly hydrated matrix composed of pectin and other hemicelluloses (Carpita and Gibaut 1993). The cellulose–xyloglucan network constitutes the major load-bearing structure of the primary cell wall (Keegstra et al. 1973; Verbelen and Vissenberg 2007). It is also thought to act as a spacer preventing cellulose microfibrils from aggregating (Thompson 2005). However, the picture of interactions between the cellulose and non-cellulosic polysaccharides is still unclear. In the literature cellulose is reported among many others as an adsorbate of starch (Guan et al. 2008), lignin (Maximova et al. 2001) or chlorhexidine (Giménez-Martín et al. 2009). Previous investigations of pectin and hemicellulose adsorption on cellulose microfibrils have already been conducted (Zykwinska et al. 2008), but all experiments were done at 40 °C, which may not correspond to the conditions that might be found in environmental systems. Also, Langmuir or Freundlich models are currently favored for adsorption of xyloglucan onto cellulose (Zykwinska et al. 2008). Therefore, the aim of the present study was to determine whether the adsorption of either citrus-apple pectin or xyloglucan on the microcrystalline cellulose takes place under mild conditions similar to those occurring in nature. The mechanism of adsorption of xyloglucan molecules onto cellulose was investigated and revised as well. Results of adsorption isotherms were analyzed considering the Langmuir, Freundlich and Fowler-Guggenheim models. Commercially available polysaccharides were used in the experiment. Microcrystalline cellulose Avicel PH-101 was purchased from FMC Biopolymer (Belgium) with the average crystal size of 50 µm. Xyloglucan (tamarind, purity ~95 %, molecular weight: 225 kD (MALS) with sugar composition: xylose, 34 %; glucose, 45 %; galactose, 18 %; arabinose, 3 %) was from Megazyme (Bray, Ireland). Highly esterified citrus-apple pectin with esterification degree 59.3 % and galacturonic acid content of 428 mg/g of pectins was from Pektowin (Jasło, Poland). Cellulose was purified by boiling twice in deionized water for 3 h. The xyloglucan and citrus-apple pectin were used without further purification. All experiments were carried out at room temperature (25 ± 1 °C). The pH of the solutions was monitored by adding phosphate buffer (pH 6.9, I = 0.1); 0.50 g of cellulose was added to the 25 ml of pectin and xyloglucan solutions of different concentrations. Suspensions were shaken during the entire process (200 rmp/min). The time required for reaching the equilibrium condition was estimated by drawing samples at intervals of time until equilibrium was reached. Suspensions were filtered through syringe filters (Chromafil GF/PET-45/25), and 1 ml of clear solution was taken for determination of the concentration of carbohydrates (pectins and xyloglucan). Different initial concentrations of pectin and xyloglucan solutions were prepared by proper dilution from stock solutions with concentrations of 200 and 150 ppm, respectively. Each point of the isotherm is an average from three independent replicates. The carbohydrate content was determined by the sulfuric acid-UV method as follows (Albalasmeh et al. 2013). A 1 ml aliquot of carbohydrate solution was mixed with 3 ml concentrated sulfuric acid in a test tube and vortexed for 30 s. The temperature of the mixture rose rapidly within 10–15 s after addition of sulfuric acid. Then, the solution was cooled in ice for 2 min to bring it to room temperature. Finally, UV light absorption at 315 nm was read using a UV spectrophotometer. Solutions for the calibration curve were prepared following the same procedure as above. The specific surface area of cellulose was determined via the low-temperature nitrogen adsorption isotherm measured with ASAP 2405 from Micromeritics Inc. The results demonstrate that this value is lower than 1 m2/g, which suggests no porosity, and therefore it is better to express the adsorbed amount in mg/g than mg/m2. Moreover, the very low specific surface area suggests that the cellulose is bundled with other cellulose microfibrils leaving little space for adsorption. Morphology of polysaccharides was examined by scanning electron microscope (SEM, Quanta 3D FEG, FEI Phenom Word). Prior to SEM observation, the samples were air dried and coated with an ultrathin layer of gold in an ion sputtering machine. Zeta potential was measured with Zetasizer nano ZS-90 (Malvern) using the dip-cell system. The suspension concentration was equal to 1 g/l; 50 ml of a suspension was poured into a flask, and the pH was set by adding controlled volumes of 0.1 M NaOH and 0.1 M HCl solutions. When a stable pH had been achieved, an appropriate volume of 1 M NaCl solution was added in order to obtain the ionic strength of the suspension (equal to 0.25). Prior to all measurements, the suspension was sonificated for 3 min to ensure maximum homogeneity; 0.8 ml of a suspension was pipetted to a cuvette and thermostated for 120 s. Measurement involved 30 runs. Each experimental point is a mean value of at least four independent replicates. The concentration of xyloglucan and pectins in suspension was equal to 10 ppm when their influence on the zeta potential was investigated. In all Eqs. (1)–(3), k is an adsorption constant of the process, a m is the maximum adsorption (adsorption capacity), c stands for the equilibrium concentration, and α is a constant that describes interactions between molecules in the adsorbed layer. Equation (1) was proposed by Langmuir (1918) and assumes that adsorbed molecules of adsorbate interact only with adsorption sites on the solid surface. Equation (2) is a purely empirical isotherm proposed by Freundlich (Chang et al. 2000). Equation (3) is a Fowler-Guggenheim isotherm that takes into account lateral interactions between adsorbed molecules (Hamdaoui and Naffrechoux 2007). Equation (3) reduces to a Langmuir isotherm (Eq. 1), when there are no lateral interactions (α = 0). where MU is measurement uncertainty, SD stands for standard deviation, n is a number of replicates, and t 0.05;n−1 is the parameter of the t-Student distribution. Grubbs test for outliers was performed before the uncertainty was calculated (Konieczka and Namieśnik 2007). Linear forms of the isotherm models (Eqs. 1–3) were not considered in this manuscript (El-Khaiary and Malash 2011). Goodness of the fit was justified by the following conditions: the expected value of errors is zero (Walesiuk and Gantar 2012); errors are homoscedastic, which means that they have constant variance (Chatterjee and Simonoff 2013); errors are normally distributed and uncorrelated (Walesiuk and Gantar 2012). where p and n stand for the number of parameters of the model and number of experimental data points, respectively. The a stands for adsorption, subscripts e and t for its experimental and theoretical (calculated from the model) value. Adsorption kinetics data are shown in Fig. 1a. The results show that xyloglucan adsorbed on cellulose while no sorption was observed for pectin, although the experiment was conducted for 72 h. Moreover, equilibrium was reached for xyloglucan after approximately 3–4 h. A brief analysis of the kinetics may give some insights into the mechanism of the process, as has been shown in numerous papers (Bonifazi et al. 1996; Marczewski 2007, 2010, 2011; Deryło-Marczewska et al. 2010; Marczewski et al. 2013). The commonly applied procedure concerning adsorption kinetics data analysis is an application of the first order (FO) and second order (SO) kinetic equation in linear forms as it was depicted in Fig. 1b, e.g., the Lagergren plot for the FO equation (Akmil-Basar et al. 2005; Marczewski 2010): ln(a t − a eq) versus t and t/a t versus t for the SO equation where at stands for adsorption at time t and a eq for the amount adsorbed in equilibrium. However, such a method requires data transformation, which may lead to further transformation of data deviation (Draper and Smith 1998; Carroll et al. 2006; Chatterjee and Simonoff 2013). Therefore, in this study, fitting data to linear forms of FO and SO was done only to evaluate the equilibrium adsorption value used in further analysis with a multiexponentional equation (to calculate the adsorption progress precisely). where F is the adsorption progress (fractional attainment of equilibrium, a t /a eq), f i is the contribution of the ith process in total adsorption, and k i is the kinetic constant of an ith process; t stands for time. Results are presented in Fig. 3. In the present calculations, the three components were used; however, it was determined that only two of them were required to describe data sufficiently well. Calculations showed that 0.243 of a total adsorption may be explained by the fast process (k 1 = 0.072 s−1), and 0.757 of the entire adsorption is contributed to a slow process (k 2 = 3.09 × 10−3 s−1). Figure 1c presents the Weber-Morris plot on which the presence of linear region suggests that intraparticle diffusion might be one of these processes (Wasewar et al. 2008; Płaziński and Rudziński 2009). However, the specific cellulose structure, for example, specific surface area <1 sq. m/g (measured by low temperature nitrogen adsorption), suggests that the mechanism could be slightly different here. As was shown, the high content of cellulose in the suspension may result in an inhibition of mass transfer in the system (Roberts et al. 2011). Therefore, the structure of the cellulose in the suspension in some way mimics a complex pore structure of adsorbents with higher surface area, e.g., activated carbons. An important argument in favor of such a statement is the fact that polymeric molecules with high molecular mass, such as xyloglucan, would be more susceptible to a proposed adsorption mechanism. The other process that might play a significant role in the total adsorption rate is reconformation (sometimes called relaxation) of a polymer (in this case xyloglucan) in the adsorbed layer (Scheutjens and Fleer 1979; Shulga et al. 2003; Patkowski et al. 2014). When most of the available surface is coated with xyloglucan, a new free surface available for the ‘bulk’ polymer molecules to adsorb may be created only after macromolecules in the adsorbed layer have changed their structure to a more compact one. This may happen by creating more loops (which decreases amount of trains) or by desorption and almost instant adsorption of the same molecule in a different structure, which requires less surface area on a cellulose fiber (Patkowski et al. 2014). This hypothesis is strongly supported by the equilibrium adsorption data, which will be discussed further in this article. The two-step adsorption mechanism of xyloglucan on cellulose was previously proposed by some authors (Pirich et al. 2015; Villares et al. 2015; Dammak et al. 2015). Moreover, Winter et al. (Winter et al. 2010) showed that the stability of the bacterial cellulose nanocrystal suspension increases above a certain concentration ratio of xyloglucan, which may be due to a change in the dominant molecule conformation on the surface. Villares et al. postulated that for a low bulk xyloglucan concentration adsorption (driven by diffusion), the kinetics constant is comparable to the reconformation kinetics constant. For higher bulk concentrations (and thus higher adsorbed amounts), the reconformation constant decreases and reconformation becomes a limiting stage of the process. The mechanism proposed in this article is very similar. During the equilibration, two processes occur that limit the total kinetics of adsorption. These processes are most likely diffusion and reconformation. The analysis of the presented data and findings of Villares et al. (2015) allow us to postulate that the fast process (which contributes to 0.243 of the total adsorption kinetics) is a diffusion through a dense cellulose suspension and/or surface diffusion in the adsorbed layer, and the limiting and dominant one (explaining 0.757 of adsorption) is reconformation of molecules in the adsorbed layer. The fast process most likely occurs when the locally surface concentration of xyloglucan (adsorption) is low. So even for a high bulk concentration of xyloglucan, the net mechanism is a combination of two processes. However, further studies are needed to exclude other possibilities and examine whether the adsorption of xyloglucan on cellulose is assisted by some chemical reactions (e.g., during reconformation or sorption itself). Adsorption equilibrium data obtained for the Langmuir and Fowler-Guggenheim isotherms are shown in Fig. 2. This result confirms that only xyloglucan adsorbs on cellulose in the chosen experimental conditions. In order to avoid error transformations (Draper and Smith 1998; Carroll et al. 2006; Chatterjee and Simonoff 2013), the experimental data were fitted directly to nonlinear forms of the Langmuir, Freundlich and Fowler-Guggenheim isotherms; see Eqs. (1)–(3). The statistical tests were performed to choose the best fitted isotherms. Results are presented in Table 1. A Fowler-Guggenheim adsorption was the best to describe adsorption in the studied system (see also Fig. 2), even despite the fact that it has more parameters that were found by adjustment of R a 2 and AICcorr. Therefore, this is evidence that lateral interactions play an important role in the adsorption of xyloglucan on cellulose. This result also confirms that chain-chain interactions as well as xyloglucan reconformation was probably a process that could limit the adsorption kinetics, as was mentioned above. It is also worth noticing that some authors (Pirich et al. 2015) compared the Freundlich and Langmuir model when describing the adsorption of xyloglucan on cellulose. However, none of these two models is able to include lateral interactions in the adsorbed layer, which were proposed in the literature (Pirich et al. 2015; Dammak et al. 2015). Therefore, in future analysis, the Fowler-Guggenheim model and its parameters may help in the qualitative and quantitative description of the adsorption of xyloglucan on cellulose. The zeta potentials of the system are shown in Fig. 3. Any difference in the zeta value in comparison to the control system without the adsorbate was a result of either incorporation of a charge into a diffused layer or a shift of the slipping plane (Grządka 2015). Both mentioned processes were results of adsorption; therefore, the change in zeta potential of cellulose dispersion in the presence of xyloglucan and no change in a wide pH range in case of pectin confirmed the previous observation that pectin did not adsorb on cellulose in the studied system. Since there was no pectins adsorption onto cellulose, only the SEM images of cellulose, xyloglucan and the cellulose after adsorption of xyloglucan in two magnifications are presented in Fig. 4. The cellulose has a natural tendency to aggregate (Fig. 4a, e), while the xyloglucan was smaller compared with cellulose (Fig. 4b, f). In the adsorption experiment, after the addition of 7.5 ppm of xyloglucan, the SEM images showed the cellulose still had a tendency to aggregate, and the aggregates were surrounded by the smaller xyloglucan (Fig. 4c, g). However, after addition of 112.5 ppm, there was no further evidence of cellulose aggregation (Fig. 4d, h), which is in accordance with the results obtained from the atomic force microscope for celery (Apium graveolens) cell walls in which the removal of xyloglucan and pectins induced the cellulose microfibrils to self-associate and aggregate (Thimm et al. 2002, 2009). The recent findings suggest that xyloglucan plays the role of the molecular binder and is involved in the adhesion of microfibrils over short distances (Cosgrove and Jarvis 2012; Park and Cosgrove 2012). In the present study, Avicel cellulose was used, which is highly crystalline (53.8 %) and mostly contains the Iβ structure (96 %) (Szymańska-Chargot et al. 2011). Chambat et al. (2005) showed the different cellulose structures, for which the crystallinity and specific surface area are key factors that potentially influence xyloglucan binding. Because the effective surface area for binding varies with xyloglucan size, the binding kinetics are complicated and partly limited by size-dependent xyloglucan diffusion into the pores of the particles (Park and Cosgrove 2015). During cell wall formation, the xyloglucan probably is not only connected with the cellulose microfibrils via hydrogen bonding but also physically interwoven into them (Pauly et al. 1999). The adsorption kinetics and zeta potential measurements confirmed that only xyloglucan adsorption on microcrystalline cellulose occurs, while adsorption of pectins was not observed. In the case of the xyloglucan/cellulose system, equilibrium was reached after approximately 3–4 h. Multiexponential analysis of the adsorption kinetics suggests that two components influenced the process. We postulate that these were diffusion of an adsorbate through the dense cellulose suspension and reconformation in an adsorbed layer, which means that interactions between xyloglucan chains play an important role in total adsorption. Since xyloglucan adsorption was well described by the Fowler-Guggenheim isotherm, the lateral interactions in an adsorbed layer play an important role. Moreover, the presence of xyloglucan in the cellulose suspension increased the zeta potential in a wide range of pH. Because this may be attributed to at least two phenomenon, namely shift of the slipping plane and incorporation of a charge in an adsorbed layer, the only conclusion that can be made is that xyloglucan adsorbs on cellulose. The study was supported under project no. 2011/01/D/NZ9/02494 funded by The Polish National Science Centre Poland (NCN).